Shahram Jalaliniya. Photo: Malin Palm. While some people are still amazed that we can carry a computer in our pocket, Shahram Jalaliniya is looking for the next step in wearable technology. As a postdoc researcher at the Internet of Things and People research center, he wants to find new ways for us to work with computers, and for computers to work with us. 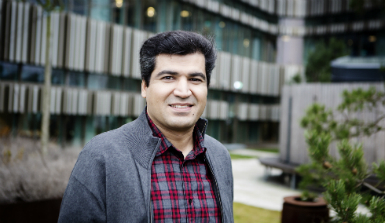 During his recent PhD studies at IT University of Copenhagen, Shahram designed a wearable system for surgeons in hospital environments. It was the limits of traditional computers in supporting mobile users that sparked his interest for developing a wearable system for surgeons. As part of his PhD, Shahram also explored gaze interaction with wearable computers. By reading eye movements, systems can figure out what kind of information the user is looking for; this is what Shahram and his colleagues refer to as eye tracking for implicit interaction. In this way, the eye movements can be used as an implicit input for interaction with a smart device or smart environments. With new technology creating possibilities in the field, it’s not impossible that the interest for eye tracking might soon catch up with that of virtual reality. Text: Amanda Malmquist, originally published under Medarbetarporträtt at the Faculty of Technology and Society. » Shahram Jalaliniya is currently involved in the CoSIS and ECOS projects. Also see Jalaliniya’s publications.